This is a truly fine example of a more traditional IPA – it’s a no nonsense exquisite craft beer with a malty caramel nose – and then lovely bitter citrusy upfront flavours – finally overtaken by a full-bodied biscuity maltiness that all ends in a burst of thirst quenching passion – leaving me, the drinker, feeling extremely satisfied with a big grin on the old chops! It’s not a crazy hopped beer, but that doesn’t mean it doesn’t have pleny of that lovely citusy hoppiness which is just right and very well balanced. Old Dairy Blue Top is actually hopped using Styrian Goldings rather than some of the more extreme hops used today, and because of that it doesn’t really taste like what many would consider a modern-day IPA. However it certainly does gravitate more towards the traditional IPAs and in this case it’s the maltiness that sets it apart and makes it memorable. So a Bru Haroo 4 star rating for this big cow beer! 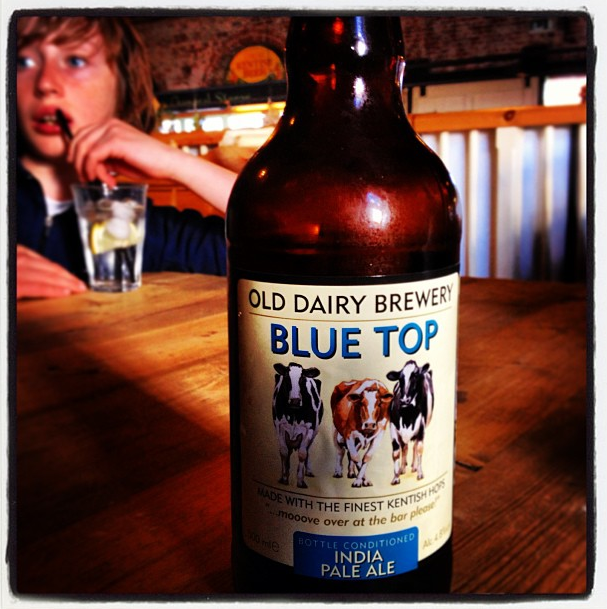 Blue Top maintains the heritage of the famous India Pale Ales which were originally brewed in the 18th century to satisfy demand for English beer in India. In order to survive the voyage unspoilt the beer was always strong and well hopped. Our Blue Top has a satisfying bitterness smoothly balanced with caramel flavours from the crystal malt and a hint of lemon from Styrian Golding hops.